Note: Be sure to download the correct zip file. One is for versions 2.0.x through 2.2.x of opencart, the other is for versions 2.3+ of opencart. Note: We do not offer support for this module. You are on your own to test, and on your own with errors. Note: NOT FOR OPENCART V1.5. 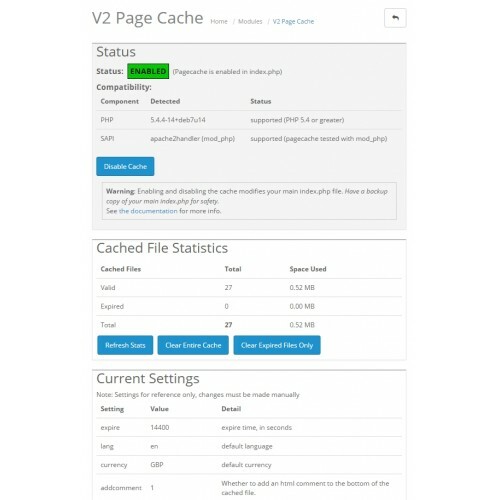 See our other page cache mod for Opencart 1.5.X. Supports caching responses for desktop, mobile & tablet separately. See cachebydevice setting, off by default. Beta quality. Testing performed mostly in an apache mod_php environment with PHP5.4. Make a backup copy of your main index.php file before enabling the cache. The enable/disable functions make modifications to your index.php file. See demo site here: http://octurbo.com/pcache2/. Load a page twice (to make sure it's cached first), then do a view source, and you'll see an html comment at the bottom. This is running on a tiny 512MB digitalocean VPS, with 4 other opencart installs, but it's still relatively fast. Easy to use. I've never had any issues.